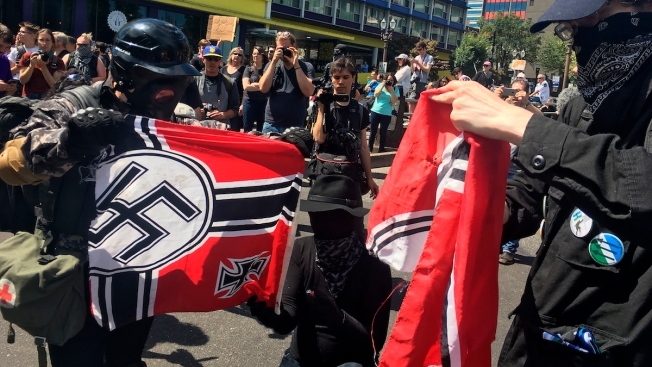 FILE - In this Aug. 4, 2018, file photo, counter protesters tear a Nazi flag, in Portland, Ore. A member of Portland's city council says she is shocked by a newspaper report that the commander for the police rapid response team exchanged friendly text messages with a leader of far-right protests that have rocked the city. Councilwoman Jo Ann Hardesty said the reporting in Willamette Week on Thursday, Feb. 14, 2019, confirms there are members of the Portland police force who work in collusion with right-wing extremists. A member of Portland's city council said Thursday a newspaper's report that the commander for the police rapid response team exchanged friendly text messages with a leader of far-right protests that have rocked the city confirms collusion exists between some police and right-wing extremists. "I am not shocked, and I am not surprised at today's reporting of Lt. Jeff Niiya's collaboration with Patriot Prayer leader Joey Gibson over text to provide aid and support for their hate marches," Councilwoman Jo Ann Hardesty said in a statement. Willamette Week obtained text messages through a public records request between Niiya and Gibson. The texts purportedly show Niiya had a friendly rapport with Gibson, frequently discussing Gibson's plans to demonstrate. In one text reported by the newspaper, Niiya tells Gibson that he doesn't see a need to arrest his assistant, Tusitala Toese, who often brawls with antifascist protesters, even if he has a warrant, unless Toese commits a new crime. "Just make sure he doesn't do anything which may draw our attention," Niiya texted Gibson on Dec. 9, 2017, Willamette Week reported. "If he still has the warrant in the system (I don't run you guys so I don't personally know) the officers could arrest him. I don't see a need to arrest on the warrant unless there is a reason." A police spokeswoman said it is not unusual for officers to suggest people turn themselves in to avoid being arrested on a warrant, Willamette Week reported. "In crowd management situations, it may not be safe or prudent to arrest a person right at that time, so the arrest may be delayed or followed up on later It is not uncommon for officers to provide guidance for someone to turn themselves in on a warrant if the subject is not present," Lt. Tina Jones said. Portland police were accused at a protest last August of being heavy-handed against people, injuring some, who were protesting a rally of extreme-right demonstrators organized by Gibson. Hardesty said the "broken policing system in Portland" must be addressed. "This story, like many that have come before it, simply confirms what many in the community have already known - there are members of the Portland police force who work in collusion with right-wing extremists," she said.